We have a new residence move in at Catanger. 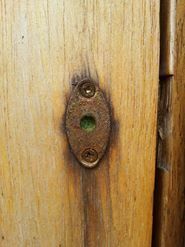 A female solitary bee has decided that one of our toilet lock holes is a great and safe place to lay her eggs and has filled the hole over with pollen. Solitary bees differ from honeybees and bumblebees in not being social insects. A female solitary bee constructs and provisions her nest without the assistance of any worker bees…. 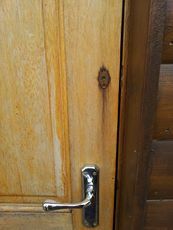 Unfortunately this means we cannot lock the toilets until her family emerge! Very clever bees.